The Parish Council was petitioned by individuals to consider the provision of a Defibrillator [or to give it is full name, an Automated External Defibrillator (AED)] within the village and for Public use in the event of an emergency situation. Following much discussion on the subject, the Parish Council decided that the provision of a Defibrillator was in the public interest and that it was an acceptable use of money from our New Homes Bonus fund. 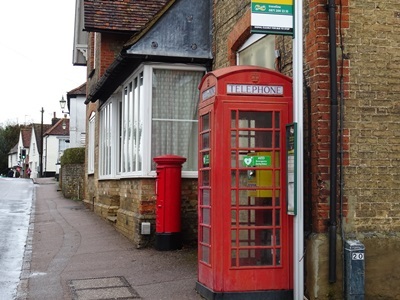 After considering various options, it was decided that it would be appropriate to install the device in the redundant K6 telephone kiosk (a listed building in its own right and now a Parish Council asset) adjacent to the Bull pub in the High Street. 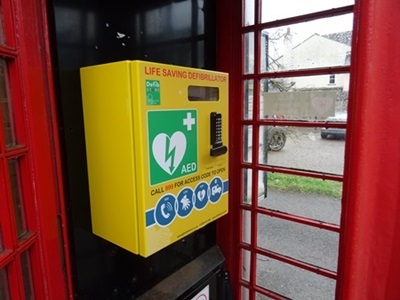 However, acquiring the kiosk from BT and getting planning permission for ‘Change of use for a Listed Building’ from EDHC took nearly eight months; but finally the Defibrillator was installed and commissioned ready for use during March 2018. The Defibrillator can be operated by any responsible person and it issues verbal instructions to the user during the procedure. It will not function unless the Defibrillator itself decides that it is safe to do so.